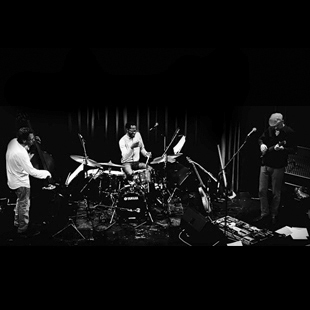 Connected by a close and deep long-term friendship Wolfgang Muthspiel, Larry Grenadier and Brian Blade together form Wolfgang Muthspiel Trio and have mastered the art of transferring their personal bond to musical realms in fascinating ways. All three musicians resemble each other in their interpretation of jazz – very lyrical and not primarily or exclusively footed in its tradition. While always crossing borders in their diverse respective musical projects, they all never seem to become shy of experiments, always marking their musical territory with care, without getting lost in its vastness. Their playful dynaimc interactions ranging from soft and poetic melodies to on the edge grooves and tricky harmonies lead to an atmosphere that makes this austrian-american trio unique. Every note embedded in warm sound is remarkable and personal in its own way, opening up space as if by magic and revealing its depth. The music seems to be in some kind of permanent levitation, never touching ground and taking off all of Jazz’s putative complexity, converting it into accesible but aesthetic elegance in a soulful picturesque manner – an achievement not many master with this kind of flawlessness. Their latest album «Driftwood» was release in 2014 via ECM.